December 6th is the Feast of Saint Nicholas, Saint Nicholas Day. I can’t imagine what the year would be like if this day fell outside of the Christmas season! Something, it seems, would be very wrong with the world. I’m a fan of Saint Nicholas. Since childhood, of course, but as I grew to adulthood, I learned more about the man and his qualities, most of them as magical, if not universal, as those associated with his persona as Santa Claus. Saint Nicholas is the patron saint of children, his main association with Christmas, but he’s also the patron saint of sailors (particularly meaningful to me), thieves (far less so . . .) students, bankers, pawnbrokers and vagabonds. As patron saint of Russia, he’s very important to the Russian Orthodox Church. 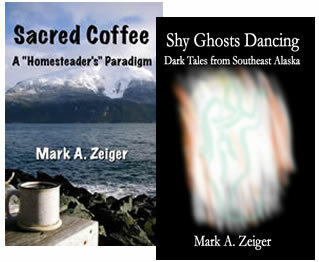 His icon is prominent around Sitka, Alaska, once the capital of Russian America. He’s also the patron saint of Greece. In fact, worldwide, he is said to be invoked in prayer more than anyone other than the Virgin Mary and Christ. I wasn’t raised Catholic or Eastern Orthodox, so I was never taught to venerate saints. Somewhere along the way, though, I developed a taste for iconography, and have a small collection of Saint images hanging on the bedroom wall. Most of them are of St. Nicholas. In fact, he is the one Saint whose portrait I can recognize most of the time, no matter the artist or style. His high domed forehead and bald pate, fringed with white hair is distinctive. My two favorite St. Nicholas icons are my Russian one, for its associations with my boyhood in Sitka, and another that shows him saving sailors who are about to drown—an action icon, if you will. In Europe, St. Nicholas Day is when many children receive their Christmas gifts. December 5th, the Eve of St. Nicholas, is the night that many children hang stockings, or place shoes and baskets by the front door to be filled in the night. In some country’s traditions, such as Holland, St. Nicholas visits during waking hours, with all the family in attendance. If you use an Advent calendar to mark the days till Christmas, as my family always did, you will notice that most of the European ones, and virtually all of the German ones, reveal a picture of Santa Claus in one form or another on this day. Often he is shown knocking on a door. As a child, I never wanted anything to contradict my personal concept of Santa Claus, shaped largely by seasonal advertisements from the Coca-Cola Company. I saw him as a wholly benevolent gift-giver, whose only interest was to make children like me happy. As I grew up, I embraced the folkloric aspects of St. Nicholas, and began to revel in older, more diverse visions of him. The European St. Nicholas, a benevolent but stern figure, quick to remind children of their bad behavior, and even punish them for it if necessary, particularly intrigued me. Also, I love a common conception of him in parts of Germany as a gaunt traveler, grimly determined and ineffably weary from his journey to reach all the children of his region. In some traditions Knecht Rupprecht, a demon-like figure that doles out any needed punishments, accompanies him. In others he travels with the Kristkind, an angelic manifestation of the Christ child. Luckily for my parents’ mental health, I made my peace early with the questions surrounding Christmas Eve physics and logistics. The first home I remember had a huge chimney, easily man-sized to my eyes, and our house was fairly well separated from other houses, even farther from houses with any children living in them. The concept of Santa Claus described in Clement Moore’s A Visit from St. Nicholas worked well for our house and neighborhood, much better than it would have in a crowded tenement. As an adult, and as a casual collector of illustrated editions of Moore’s poem, I see this spatial arrangement as key to the vision. Santa Claus needs a sleigh and a team of reindeer to visit distant places. From this, I came to love the classic depictions of St. Nicholas trudging through the snow to visit remote homes. I cherish a postcard that I found at an estate sale years ago. It shows a remote, snowbound farmstead with a tiny figure dressed in red struggling toward it through snowy fields, pulling a sled. 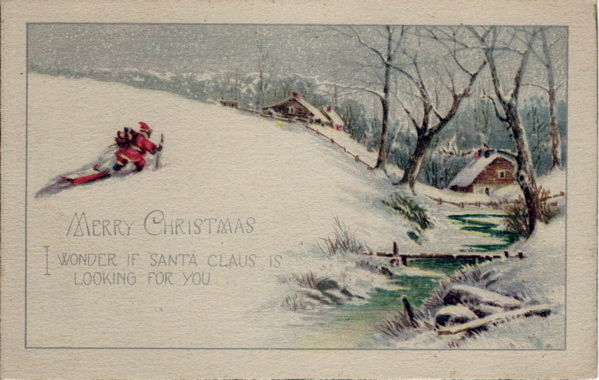 The postcard reads: “Merry Christmas. I wonder if Santa Claus is looking for you?” I confess a moment’s panicked horror when I first read the card. Even in my twenties, my inner child fretted, “Of course he’s looking for me! Why wouldn’t he be?” But I love the uncertainty, the idea that because you are so far distant from other settlements, Santa really has to work to get to where you are. This idea is now fully realized in our current home. Santa indeed needs to hike, or fly in his reindeer sleigh, to reach the homestead. Our tradition, observed even now, in Aly’s teens, is to wait for him on Christmas Eve, but we also remember him on December 6th, his feast day, and wish the venerable Saint Nicholas all the joy of the day, and of the Christmas season. Music for the day: Legends of St. Nicholas: Medieval Chant & Polyphony by Anonymous 4.